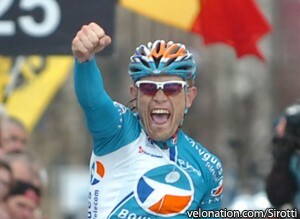 Steve Chainel is to join AG2R La Mondiale from 2013, on a two-year contract, the team has announced. The 29-year-old from Remiremont, in the Vosges department of eastern France, is one of the country’s top cyclocross riders, but the International Cycling Union (UCI) WorldTour team hopes that he will add some Classics strength to its team as it builds for next season. Chainel turned professional in 2009 with Bbox Bouyges Telecom [now Europcar], having spent two years at semi-professional Auber 93, and has spent the last two years at FDJ-BigMat. AG2R La Mondiale recently lost the services of Nicolas Roche to Saxo Bank-Tinkoff Bank, who has spent the last rour years with the team, but recently secured the contracts of Colombian Carlos Betancur and Italian Davide Appollonio from Acqua & Sapone and Team Sky respectively. Chainel - whose wife Lucie Chainel-Lefèvre also rides cyclocross at an elite level - has achieved most of his big results in the off-road winter sport, but rides strongly in the Spring Classics. Eighth place in this season’s Gent-Wevelgem, and sixteenth in Paris-Roubaix, are testament to this, and is something that his new team hopes to build on next season. His three road victories to date consist of a stage and the overall classification in the 2008 Circuit de Lorraine - his home region - and the opening stage of the 2010 Driedaagse De Panne Koksijde. Chainel’s transfer will see him leave behind one cyclocross rival in Francis Mourey, but joining another in John Gadret. In addition to the acquisition of Chainel, AG2R La Mondiale announced contract extensions for Guillaume Bonnafond until 2013, and Sébastien Minard, Lloyd Mondory and Rinaldo Nocentini, who will sport the “terre et ciel” [earth and sky - ed] colours through 2014.